Wilko has re-opened its doors at Bishops Stortford, in Jackson Square, after refurbishment. 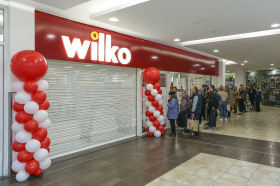 Queues outside the new store started forming at 8am with more than 75 shoppers keen to get a first look at the newly transformed wilko store and take home some fantastic freebies. The store refresh means customers will encounter an entirely new wilko which will take them on a new shopping experience, where they will be greeted by new aisles and will be able to browse and shop the great selection of seasonal products wilko has on offer. The first 100 customers received a free goody bag, including a £5 wilko gift card, wilko grey photo frame, wilko fruits shower gel and wilko candle tin almond and cashmere. Wilko Bishops Stortford manager, Holly Atkins, said: “We have been overwhelmed by the support of the local people and it was amazing to welcome back our loyal customers.